LG V20, the first phone to ship with Android 7.0 Nougat out of the box, was officially unveiled in San Francisco on Tuesday. The LG V20 will be available in Korea later this month, and is expected to launch in India and other markets soon. LG V20 price would be revealed as and when it hits the retail shelves across the globe. The LG V20 is made out of AL6013 metal – which is used to build aircraft, sailboats, and mountain bikes – and LG claims it can easily survive drops from a height of four feet. It comes with a 5.7-inch main IPS Quantum Display and a secondary display, also seen on the LG V10. The secondary display on the LG V20 comes with a font size that’s 50 percent larger font size compared to the V10, making it easier to view notifications and alerts at a glance. The new Expandable Notifications feature lets users tap a button on the Second Screen to enlarge notifications in order to check long messages at a glance and quickly send a reply or share information. The LG V20 comes with features like 32-bit Hi-Fi Quad DAC (with support for flac, dsd, diff, and alac file formats), HD Audio Recorder, and B&O PLAY speakers, to keep the audiophile in you happy. LG has packed the V20 to the brim with features to keep shutterbugs happy as well. There’s a dual rear camera setup, a 135-degree 8-megapixel lens accompanied by 16-megapixel 75-degree lens, accompanied by a 5-megapixel 120-degree lens on the front. The Auto Shot feature detects when you are smiling and automatically clicks a selfie. The LG V20’s Hybrid Auto Focus (HAF) integrates three AF mechanisms – Laser Detection AF, Phase Detection AF, and Contrast AF – for both videos and photos. LG V20 can also record Hi-Fi videos and the optional Low Cut Filter (LCF) technology is said to remove unwanted background noise and Limiter (LMT) while recording audio, which can now be captured using 24-bit / 48 kHz Linear Pulse Code Modulation (LPCM). Optical image stabilisation (OIS) 3.0 is thrown in for good measure. LG V20 of course comes with Android 7.0 Nougat, and the Google In Apps search function, with LG UX 5.0+, an upgraded version of the LG UX 5.0 first introduced on the LG G5, on top. The new In App search in the Google app, lets users find content from built-in apps including contacts, emails, text messages, and photos, as well as from user-installed apps. It also features the Multi-window mode, that lets you run two apps side-by-side. 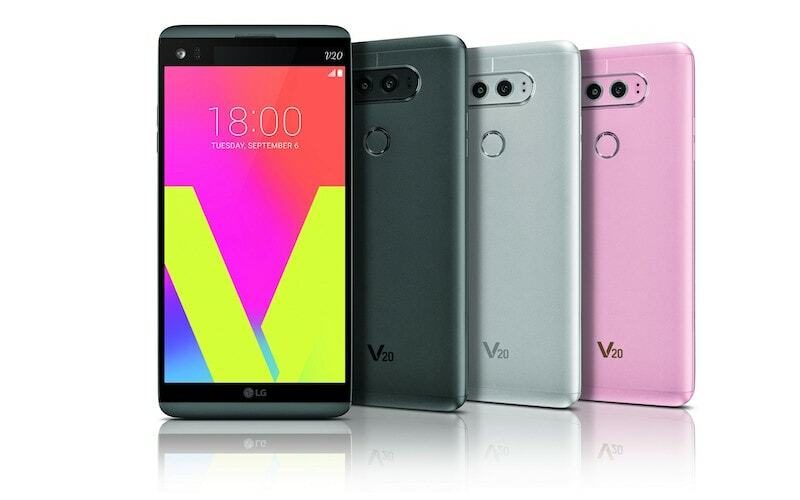 LG V20 packs in a USB Type-C port and it will be available in titan, silver, and pink colours. In terms of other specifications, the LG V20 is powered by a quad-core Qualcomm MSM8996 Snapdragon 820, with two cores clocked at 2.15GHz and the other two running at 1.6GHz. It will come with 32GB and 64GB storage options, with a microSD slot to expand it by another 256GB. It is powered by a 3200mAh battery.